K-MAC Facilities Management Services is one of Irelands leading facilities management companies providing an integrated approach to operating and maintaining the buildings and facilities of an organisation. K-MAC is an Irish owned Facilities Management Company. The company was formed in 2006 by Kevin McDonagh. 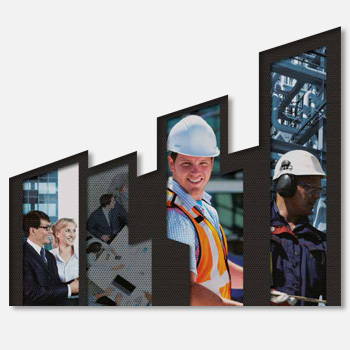 K-MAC has extensive management and technical experience in all aspects of facilities management services, mechanical and electrical maintenance, environmental health & safety, energy management and project management. K-MAC operates within the 32 counties of Ireland in the pharmaceutical, health care, electronic, heavy industry, call centre and printing industries providing all aspects property and commercial building management. K-MAC recruit and retain professionally qualified managers and engineers with experience and qualifications in construction and civil engineering, property management, mechanical and electrical engineering, surveying, project management and procurement. K-MAC staff are trained and familiarised with the systems installed in the client’s premises; the client therefore always has access to trained, competent staff. K-MAC currently provides Facilities Management Services to a number of U.K. based companies with operations in Birmingham, Cardiff, Glasgow London and Liverpool. Our Values are at the heart of everything we do; they define the way we behave, both with each other and with our customers and partners. We respect our clients, our suppliers and each other. We do things safely and sustainably. It's good for our people, our business and our local communities. Everyone has valuable input. We value the contribution of each individual and we work together to build strong, open and trusting partnerships. We look, listen, learn and adapt our ideas and experience into better solutions and service for our customers. We take pride in the service that we deliver. We believe in doing a great job and helping our customers and partners to succeed. The diverse backgrounds and perspectives of our staff help us to think differently. We work hard to turn our ideas and experience into better solutions and service for our customers. At all times our Values guide the way we work; both with each other and with our customers and partners. Kevin is a graduate of Limerick Institute of Technology with a BSc in Electrical Engineering and a diploma in Business Management. Kevin has spent over 15 years in Manufacturing Engineering and 14 years in Facilities Management. He started his career as an electrician, and progressed through the ranks from Technician to Supervisor to Engineering Manager and finally becoming Head of Facilities with a UK based multinational Facilities Management Services company. Kevin left the post of Head of Facilities to start up K-MAC Facilities Management Services Ltd. in 2006. Since its start-up, K-MAC has acquired over 30 loyal clients ranging from Multinational Manufacturing sites to Commercial Office Centers, Health Care Facilities, Local Authorities, Education, Retail and Financial Services. After completing his diploma in Electrical and Electronic Engineering, Gerard started his career as a Service Engineer. Gerard has over 20 years experience in Control Systems, Technical Services and Contract Management. Gerard joined K-MAC in 2008 and is responsible for the operations and service delivery of K-MAC facilities management services country wide. such as ESB and Intel before returning to college to achieve a Master’s degree in Maintenance Management. Paul achieved a Distinction & Excellence Award. Paul has since 2013 taken on the roles of Maintenance Manager in conjunction with Environmental, Health & Safety Manager. We provide and manage people, premises and equipment to support the efficient delivery of our customer’s core business activities. We provide innovative, reliable and flexible services that ensure the whole life operability of your assets. An acknowledged leader in the field, K-MAC Facilities Management Services has built a reputation for maintaining cost-efficient operations while continuously improving the level and quality of service. With experience ranging across virtually all property types – from corporate headquarters to retail outlets, state agencies and industrial complexes – K-MAC Facilities Management Services currently provides facility management services throughout Ireland and the United Kingdom. Focus on core business operations, safe in the knowledge that your buildings and services are in expert hands, benchmark your costs and discover significant savings on your Facilities Management Services spend, guarantee full compliance in an ever-changing statutory climate, benefit from the extensive knowledge and experience of a K-MAC Facilities Manager, build the right foundations for future growth by optimising your Facilities Management infrastructure, tailor a facilities management services solution according to your precise needs. We adopt a unique approach to the way we design and deliver services, getting to know our customers’ businesses inside and out, working with our clients to create true partnerships. We provide facilities management services to over 400 properties maintaining and operating buildings to ensure that everything runs smoothly for the people who use them. We are flexible in our delivery approach using direct employees, local SME's or a mix of both in line with customer preferences, the nature of the work and the availability of local expertise. We ensure that our customer’s properties are operating as they should be, ensuring statutory compliance, and maintaining your Mechanical and Electrical services such as fire systems, lighting, heating, cooling systems etc. to ensure people work safely and comfortably. Our integrated offer includes the lifecycle and care of assets, development of effective business focused maintenance regimes, and development of long term asset plans to maximise returns from the property estate. We supply and manage your soft services from cleaning, catering and security to reception, portering and grounds maintenance we place the right people in the right roles and support them through training and personal development to ensure our customers receive the very best service from our people. The environmental and cost impact of energy and energy usage is continually increasing. From our years of experience in the industry we have seen how we are using an increasing amount of energy in the workplace and its direct impact on a company's costs and to the environment. K-MAC provides a Help Desk to cover all possible operational hours of your operation. The primary role of the Help Desk is to provide you with one central point of contact and control. No matter what the issue, you have only one person to contact. K-MAC specialise in taking full ownership of your facilities and services, we see ourselves as a key member of your team. We will manage your facilities as if we were a direct employee. K-MAC Facilities Management Services Irish head office is based in Shannon, Co Clare, Ireland with supporting offices in Cork and Dublin. We also have an office in London. Details of both can be found below. K MAC Facilities Management Services, Shannon Business Park, Shannon, Co. Clare, Ireland.